I’m pleased to share yet another “Star Trek” themed game. I wrote this during middle school as part of a book report. Game play is terrible and amounts to firing weapons repeatedly with no strategy, but I was proud of it at the time. I wrote most of the game in BASIC with a machine language sound routine from Nibble magazine. There’s a bug where the title on startup appears incorrect if you haven’t enabled the 80-column firmware. I’m preserving the original bug to avoid rewriting history. You’ll need a 128KB machine and only use upper-case commands. I’m pleased to share “My Summer Reading Log” by Georgiann Flowers, my 3rd grade teacher at Woodland Elementary School. To the best of my knowledge, she never published this software outside her classroom, and nobody has archived it online. This BASIC software for the Apple II tracks a student’s summer reading progress, including titles and page counts. There’s also a nice splash screen animation. Dr. Papert’s 1980 book Mindstorms: Children, Computers, and Powerful Ideas introduces his vision for using computers in education. This vision drove the design of the Logo programming environment and remains relevant. I highly recommend reading Mindstorms, and it has recently become available online at no charge. In the first part of this series, we learned how to program the F18A using the AmpArcade library. We looked at loading the library, initializing the video hardware, and changing the backdrop color. While a good first step, that’s hardly interesting. In this part, we program the tile layer. The tile layer is versatile and useful for many applications, such as text and game backgrounds. Get a disk image here with AmpArcade and several tile layers examples. First, we must detour and understand more about how the F18A and the original VDP organize the video screen. The VDP divides the video screen into layers or planes. The software may modify each layer independently, and the hardware combines the layers to produce the final on-screen image. This concept is similar to layers in Photoshop or Gimp, and the design makes common animation simple. The background and various objects, such as a space ship or asteroid image, reside on separate layers, and the software may move objects around without needing to save/restore the background or overlapping objects. The layers have an ordering so that a higher layer will obscure a lower layer. The F18A also introduces additional capabilities to the layers, including more colors, scrolling, and more capable sprites. For this discussion, we limit ourselves to the capabilities of the original VDP since AmpArcade does not support the expanded capabilities of the F18A. The tile layer, sometimes also known as the pattern layer, divides the screen into a rectangular grid. Each grid square, called a tile, contains a pattern of pixels. In Graphics Mode I (GM1), the grid of tiles has 32 columns and 24 rows, and each tile may contain one of 256 different 8×8 pixel patterns. Other modes are slightly different, and this post only describes GM1. This “Programmer’s Guide” from Texas Instruments details each video mode. If the patterns look like letters and numbers, the tile layer is perfect for displaying text. Unlike the Apple II text mode where the available characters are factory-determined in ROM, the character set for the tile layer is up to the programmer. Want a different font? Want bold or italic? Foreign language characters? Symbols? Emojis? Line-drawing characters like MouseText? No problem. You may design your own characters. However, patterns do not need to be recognizable characters. The patterns could be elements of a game background or graphic. You may subdivide complex graphics into multiple patterns. For example, if you want a letter that is double-high, you may create two patterns, one with the top of the letter and another with the bottom. Or, if you need a gun turret for a game, you may subdivide the turret image into as many patterns as needed. Don’t underestimate this capability; look at many excellent games, and you’ll notice backgrounds with repeating tiles. Internally, the VDP uses three tables to define the contents of the tile layer. 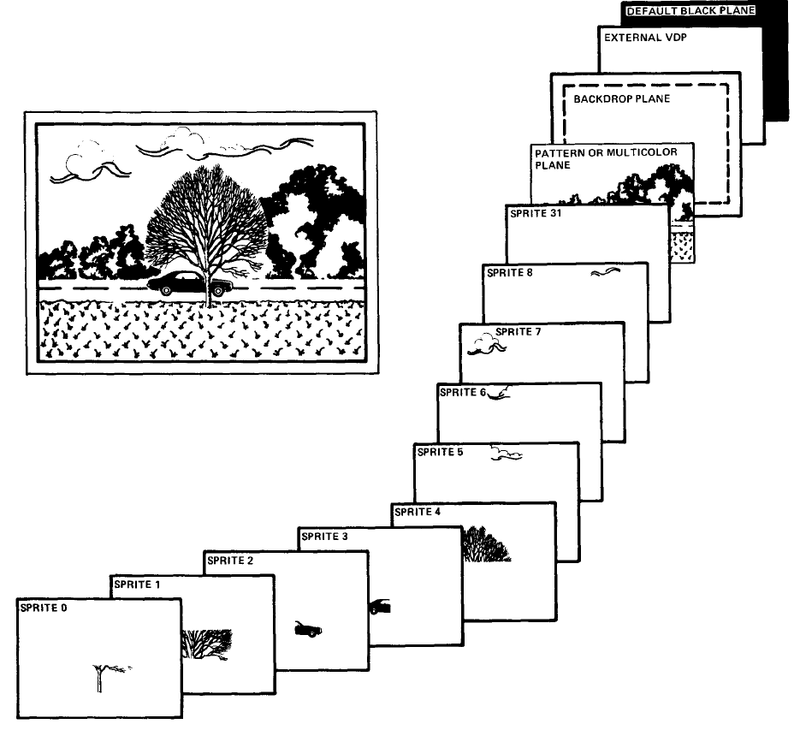 The “pattern table” describes up to 256 reusable 8×8 patterns. The “color table” describes the colors of the patterns. The color table only allows two different colors for every eight patterns, and the table contains 32 bytes (256 patterns divided by 8, with two colors packed into one byte). The “name table” describes the pattern visible in each tile, and the table consists of 768 bytes (32 columns times 24 rows). The table sizes vary with graphics mode, and these numbers only apply to GM1; however, the basic table structure applies to all modes. REM Initialize Graphics Mode I, memory layout variant A. If you’re following along, you might see the letter “A” (pattern 65) in column 10, row 20. I say “might” because we have not specified the colors. If, by chance, the color table chooses identical foreground and background colors for this pattern, you won’t be able to see the pattern. To set the color, use the CSET (color set) command. This command requires two numbers. The first number is the color group from 0 to 31. Recall that you may only set the color for a group of 8 patterns. To find the color group for a pattern, divide the pattern number by 8 and discard the remainder. For our example above using pattern 65, the color group is 8 (65/8 = 8, discarding the remainder). The second number defines the foreground and background colors for the pattern. Multiply the foreground color by 16 and add the background color to calculate the CSET color number. The following example sets pattern group 8 to foreground color 11 (light yellow) and background color 8 (medium red). REM Beginning in column 5 and row 10, set a horizontal row of tiles to patterns 65 and 65. REM Beginning in column 15 and row 15, set a horizontal row of 10 tiles all to pattern 65. REM Beginning in column 20 and row 22, set a vertical column of tiles to patterns 65 and 65. REM Beginning in column 2 and row 5, set a vertical column of 15 tiles all to pattern 65. REM Fill the entire tile layer with pattern 65. You may define all 256 patterns with 256 separate DTIL commands, but that gets really tedious really fast. It’s possible to store multiple patterns in a single binary file on disk and transfer the data to the VDP. Let’s say you have a file CHAR with patterns for a basic set of letters, numbers, and punctuation. Each pattern is 8 bytes, and the patterns are in order with the first 8 bytes representing pattern 0, the second 8 bytes representing pattern 1, and so on. The LD command requires 3 numbers. The first is the source address in the Apple II’s memory. The second is the destination address in the VDP’s memory. The third is the length of the data in bytes. REM Load the tile layer patterns from disk into the Apple II's memory at address 8192. REM A complete set of patterns requires 2 KB of memory, but you don't need to define every pattern. REM The "CHAR" file is only 832 bytes long, which defines 104 patterns (832 bytes/8 bytes per pattern). REM We could use any available memory location on the Apple II. REM Copy data for 104 patterns (8 bytes each) to VDP memory address 2048, which contains the pattern table. REM First, set the pattern group colors to a blue foreground and a gray background. REM Next, show each pattern on screen. REM Note that CHAR only contains 104 patterns, so some patterns will be whatever garbage was already in VRAM. Try writing a program that uses the CHAR patterns and displays a sentence on the screen. Then, use DTIL to define a new pattern that resembles the Apple logo and draw a red border of Apples around your message. This bootable disk image contains everything you need, including the CHAR file. In the next part, we’ll look at modern tools to help us create new patterns and tile layouts. This is the first part of my tutorial on programming the F18A installed in an Apple II. I cover installing the card and finding software. Future parts will cover more interesting topics, such as the tile layer, sprites, and F18A-specific features. Throughout, I’ll use VDP (Video Display Processor) to refer to the original TMS9918A, F18A to refer to the modern FPGA recreation of the VDP, and AppleTi to refer to the Apple II card holding the F18A. Sometimes, I use AppleTi and F18A interchangeably since you cannot have one without the other in an Apple II. For background, I recommend my AppleTi and F18A at KansasFest post. I assume you’ve assembled your AppleTi card and are ready to make it do something interesting. You may install it in any slot. Unlike the vintage Synetix SuperSprite or Third Millennium Engineering Arcade Board, the AppleTi does not support combining Apple II video and sprite card video on one monitor. Therefore, the AppleTi does not need any additional connections or have slot restrictions. Obviously, you need a separate VGA monitor for the AppleTi. If you have an Apple IIgs, be sure to set the slot to “Your Card” in the control panel. Double-check the orientation of the card. The component-side of the AppleTi should face the power supply, and the card has an arrow clearly indicating the correct orientation. If you get the card, F18A, or 7400 IC backwards, you’ll likely be stuck repairing your computer instead of playing with graphics. I recommend the AmpArcade software originally distributed with the Arcade Board. This software provides a convenient “ampersand vector” interface for programming the AppleTi with Applesoft BASIC. Graphics and fast animation are usually challenging in BASIC, but the AppleTi does not share these challenges due to unique hardware features. 10  REM   Amparcade is not ProDOS compatible because it overwrites the BASIC.SYSTEM buffers. 20  REM   This loader modifies Amparcade to function under ProDOS/BASIC.SYSTEM. 100  REM  Step 1: Reserve memory from $8800-$9975 via a GETBUFR call to BASIC.SYSTEM. 200  REM  Step 2: Load Amparcade and remove inbuilt adjustment of HIMEM. GETBUFR already did this. 210  PRINT  CHR$ (4);"BLOAD AMPARCADE"
300  REM  Step 3: Run Amparcade. 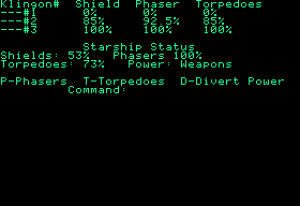 Download my disk image containing AmpArcade, ProDOS, and the above loader here. After running this loader, you should see a copyright message from Third Millennium Engineering and a few garbage characters on your AppleTi video output. The garbage is the result of AmpArcade trying to initialize sound and video switch hardware missing on the AppleTi, and you may ignore the garbage characters. AmpArcade scans all slots and will find the AppleTi in any slot. AmpArcade adds “ampersand vector” commands to BASIC. These are commands that begin with “&” and allow you to communicate with the AppleTi card. Multi-Color Mode (MCM) – This mode is similar to Apple II lo-res graphics. Graphics Mode I (GM1) – This is the most commonly used mode. Graphics Mode II (GM2) – This mode extends GM1 with more flexibility in the pattern/tile layer; however, this mode is also more difficult to program. 80-Column Text Mode (TXT2) – This mode is unique to the F18A and not present on the VDP. The modes have advantages and disadvantages, but most software uses Graphics Mode I (GM1). GM1 offers a good compromise on features and ease of use, so we’ll start with this mode. Next, we’ll set the backdrop color, which is the color that appears behind everything else we draw. Notice how fast the colors change. Try modifying the code to wait for a key press before advancing to the next color. This is it for part 1. We’ve figured out how to initialize the AppleTi and show pretty backdrop colors. Next, we’ll investigate the pattern layer, also known as the tile layer. This capability allows us to display text and is the heart of backgrounds in most games. Years ago, I outlined interfacing the F18A, a TMS9918A Video Display Processor (VDP) clone with VGA output, to the Apple II. I never followed through, but somebody on the AtariAge forum recently completed a design and released a PCB. 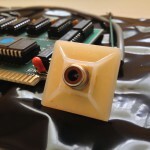 The “AppleTi” board is a functional clone of the E-Z Color Graphics Interface. The AppleTi board only supports the F18A, not the original TM9918A, and is the simplest interface possible with only a single 74LS00 NAND package generating read/write control signals. The VDP interfaces to the 6502 via two memory-mapped byte-sized registers selected with the MODE pin. The AppleTi interface connects MODE to the Apple’s A0 address signal. Combined with the “DEVICE SELECT” decoding on the Apple II motherboard, this design shadows the VDP registers across the 16 byte slot-specific address space ($C0n0 – $C0nF where n is the slot number plus 8). The practical consequence is that the AppleTi is mostly-kind-of-sort-of compatible with software written for the Synetix SuperSprite and Third Millennium Engineering Arcade Board. I say “mostly-kind-of-sort-of” because code that accesses the VDP is compatible but code that expects sound or video switch hardware won’t work. Most of the sample code from Synetix and Third Millennium won’t work. For the software that does work, there is minor VDP screen corruption from sound and video switch initialization attempts. However, despite these limitations, the AMPARCADE library from Third Millennium and the StarSprite library from Synetix do function well enough to be useful with the AppleTi/F18A board. At KansasFest 2016, I shared an introduction to the VDP, AppleTi, and programming the board with the AMPARCADE library. VIDEO: Please watch my presentation here. Thank Mr. Jason Scott for recording and uploading the video. SOFTWARE: The disk image I used, complete with the AMPARCADE library patched for ProDOS (run /SPRITE/AMPLOAD), the presentation slides as an AppleSoft program using the VDP for video (run /KFEST.VDP/PRESENT), and the simple game created during the presentation (run /KFEST.VDP/GAME), is available here. I also suggest Convert9918, a tool for creating mode 2 bitmaps, and Magellan, a tool for creating patterns, sprites, and name tables. DOCUMENTATION: I reversed engineered AMPARCADE, and partial preliminary documentation is available here. Over the next month, I hope to create a series of posts with a tutorial introduction to VDP programming. NOS ImageWriter II ribbon: The rubber roller has turned to sticky goo. Back when my Apple IIc+ was my only computer, I really wanted an ImageWriter II printer. This was “the” printer to own. It was reasonably fast, compatible with nearly all Apple II software, and printed in glorious color. Unfortunately, I was a kid with no job, and an ImageWriter II cost over $500. Needless to say, I never owned the printer back then. More than 20 years later, I finally own an ImageWriter II. Thanks to Sean’s Garage Giveaway at KansasFest a few years ago, I walked away with a nice condition printer, a stack of NOS color ribbons, and a used black ribbon. 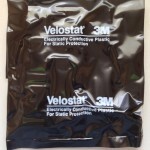 The color ribbons, despite being never used and sealed in plastic, were dead due to age. An orange rubber roller internal to the ribbon cartridge had turned to some sort of nasty goo. Every “new” ribbon I’d gathered suffered the same failure. I was rather unhappy and shoved everything in a box for another day. 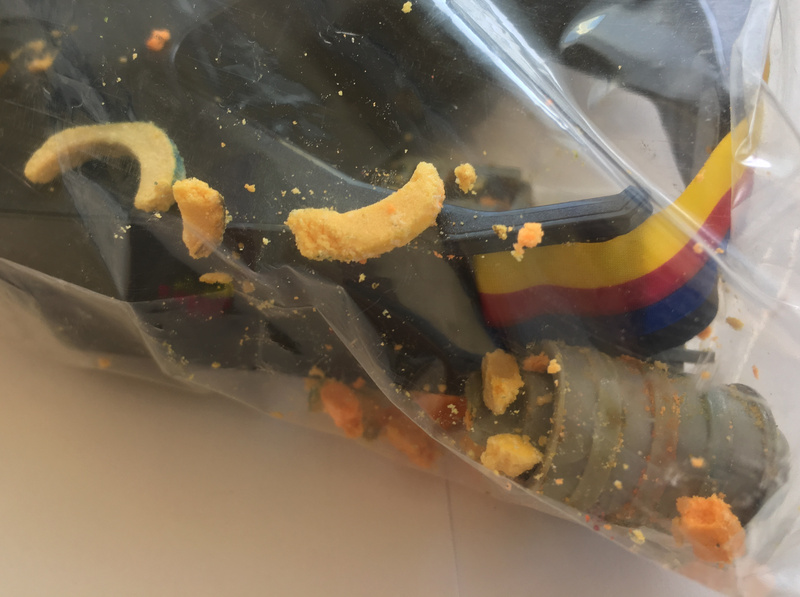 I saved the pieces of the cartridge hoping someday to rebuild it, but I have yet to open the bag and release orange goo across my desk. 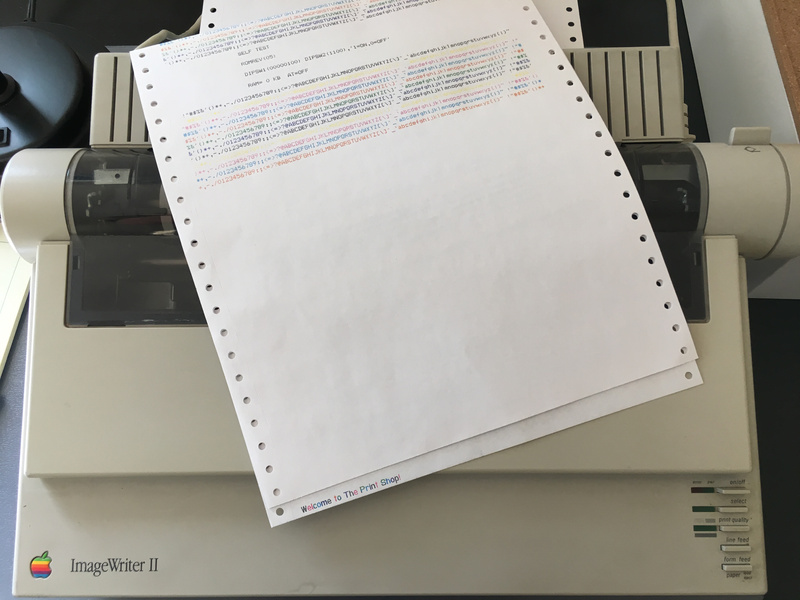 A few months ago, a fellow in the Facebook Apple II Enthusiasts group reported that he had contracted with an overseas manufacturer for a small run of new color ImageWriter II ribbons. A few dollars and a short while later, I’m finally printing in glorious color with the unmistakable “dot matrix buzz” audible at the far end of the house. I created a card and flyer with Print Shop GS, although the recipient doesn’t properly appreciate the origins. It’s a small and simple accomplishment, but there’s something satisfying about a working ImageWriter II. Sure, I love fancy hardware like mass storage and accelerators, but I neither expected to own those “back then” nor knew anybody who owned those. The lowly printer was the item that everybody seemed to own and was the missing piece in my idea of a “complete” system. ImageWriter II: It prints in glorious color and is audible across the house. No system is complete without one. Here’s a poor photograph showing an Apple IIe running Sprite Logo for the first time. The left monitor connects to the Apple II’s normal video out, and the Apple CRT connects to the sprite card. The normal video out is useless while running Sprite Logo, which makes sense because most users wouldn’t have two monitors. 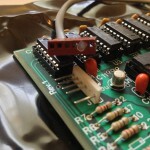 The sprite card goes in slot 2 and requires an additional ground connection to the power supply chassis, per the manual. 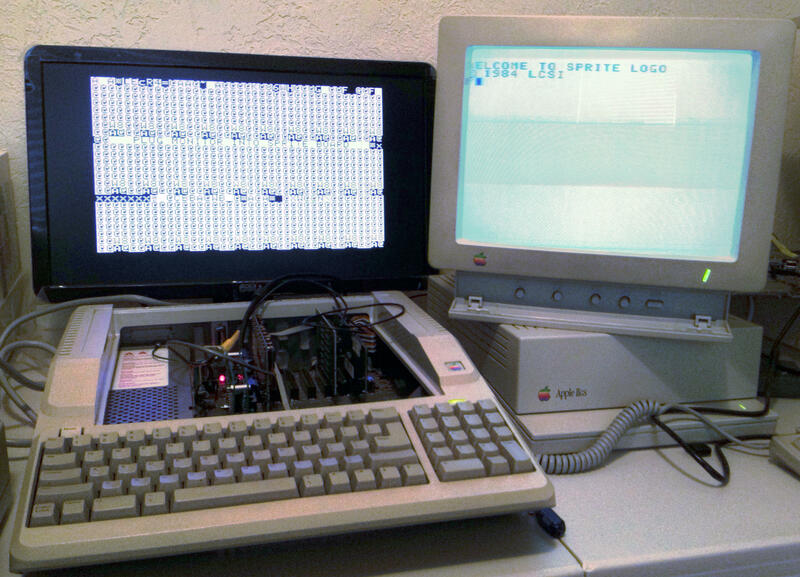 The Apple IIgs is not connected to any visible displays and serves as an overpriced monitor stand. 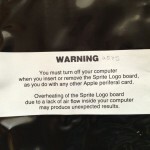 Even after a short period, the sprite card became very warm to the touch, which is consistent with a warning in the manual about heat production. I look forward to exploring some of the unique capabilities of Sprite Logo. Byte dedicated the August 1982 issue to the Logo language. This issue is an excellent cross-platform snapshot of Logo and its applications. Next in my ongoing effort to document the world’s most expensive version of Logo for the Apple II, LCSI’s Sprite Logo for the Apple II Family, I show the included hardware sprite card. 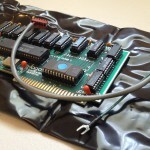 The board is a custom design from LCSI based on the TI TMS9918A video display processor, a video chip used in several personal computers contemporary with the Apple II. Most of the board area consists of the standard TMS9918A chip and support circuits, including 16 KB of video memory (U1 – U8), the video clock, and the composite out. A short pigtail brings the composite video connection to the outside of the computer case. 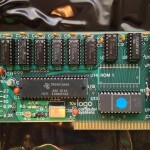 The sprite card does not display normal Apple II video, and the user must switch the cable between the sprite card and normal video output when switching between software designed for the card and other software. There’s a separate ground lead from the composite connector to the power supply. I’ve never seen a similar separate ground lead on any other peripheral card. Perhaps LCSI had trouble passing the FCC tests and added this ground as the least expensive fix. 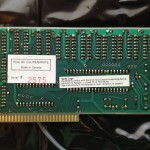 This card includes a 2 KB EPROM. A ROM (or EPROM) allows reliable software detection of the card. However, 2 KB is too large for this function alone. Since the 64 KB main memory of the Apple II is limiting for Logo, I expect the designers used the extra space for Logo-related code or data. I’ll examine the contents in a later post. There’s a second unpopulated (U14) ROM footprint. Perhaps LCSI considered using lower density EPROMs or more EPROM. The decoupling capacitors (C1 – C10) are too large for the PCB footprints. Notice how the leads are bent at odd angles to make the available parts fit. There are two unplated holes (one near C13 and another near U1) in the PCB. I have no idea why these exists. Perhaps they’re mounting holes used during manufacturing, or perhaps they’re harmless errors in the board design.